The fluid wagon, also known as the rail tanker, is capable of transporting fluids by rail. Fluids can be pumped in and out of the wagon using a pump, each fluid wagon can have a maximum of 3 pumps attached at one time, 1 per tank section. Similar to cargo wagons, a locomotive is required to move the liquid wagon. The fluid wagon can carry 25,000 units of fluid. It weighs the same of the regular cargo wagon but holds more fluid; a cargo wagon filled with barrels can carry 20,000 units of fluid. To get fluid into the fluid wagon, you need a train station with pumps. 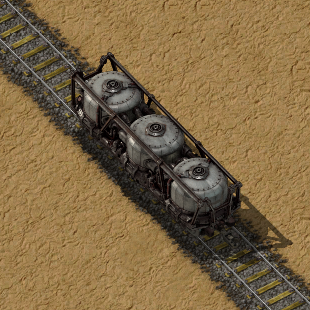 The wagon needs to be aligned with the rail grid; do this by using the automated rail transportation train stops as train schedule destination, and a fueled locomotive. Also make sure that the rails under the Fluid wagon are straight rails and not curved rails. The pumps will only work if the wagon is perfectly orthogonal to the grid. Due to current fluid system mechanics, the fastest load and unload times for fluid wagons consist of pumps that are directly attached to storage tanks. Using more pumps per wagon reduces (un)loading time.